The alternate title…the alert reader might think, implies there might be a Crunch 1 and a Crunch 2. Heh. Yep. Approaching a green light, some left turning traffic ahead slowed things up rapidly and cars stopped short. We got stopped, the car behind us didn’t. It was a fairly substantial *smack* but not what I would call serious. Good news is, nobody’s hurt. Not us, not the other driver (Hi Charlie!). Sprung the trunk. 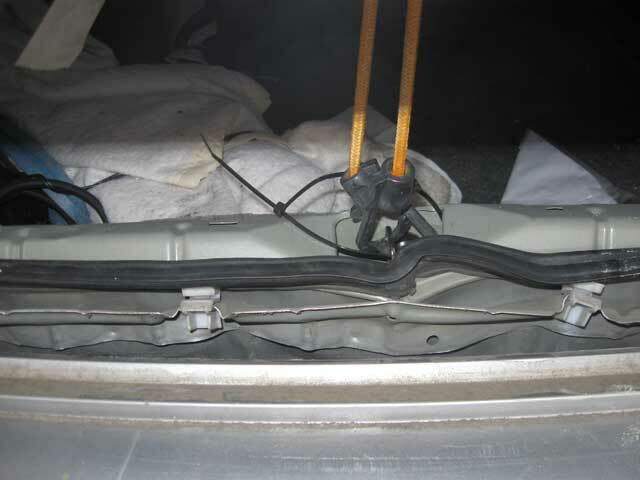 The trunk pan is bent, not sure about the lid itself. A handy bungee cord got us home. Not sure what's underneath...there are some crushed foam things and such under there. The left taillight is ruined…all the attachment points broke off. Duct tape does a good temporary job, and even matches the paint! Not sure about the right taillight. The bumper took a big hit…this is a plastic cover that has mostly come loose. I’ve no idea what is damaged underneath it. 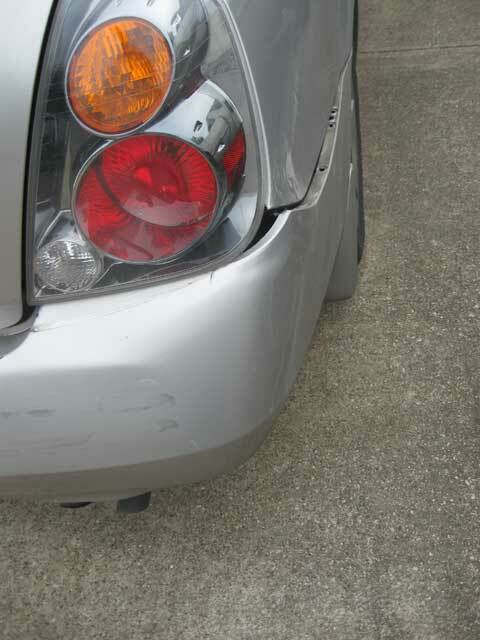 We’re actually rather embarrassed that Da Altima took so much damage…the other car has barely a mark. I suppose it would be bad form to have steel pipe bumpers on Da Altima anyway…even in Texas. The other insurance company has accepted liability. Da Altima goes in for some poking and prodding about her nether regions on Thursday. We should have an estimate shortly thereafter. 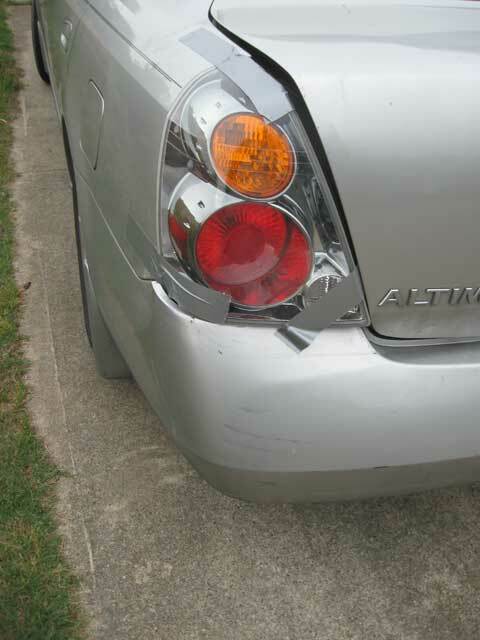 We’re hoping it’s fixable…Da Altima has been a great car and is comfortable and very usable. It gets good mileage, we’ve just barely broken it in anyway (under 80,000 miles), and we’re just not ready to buy another vehicle just yet. It SHOULD be fixable…the damage doesn’t look that bad and the car is still worth ~$10k on the blue-book…but I’ve seen these things add up to something stupid before. Da Altima got poked and prodded on Thursday to the tune of about $2300. We turned her over to Service King to get straightened out. 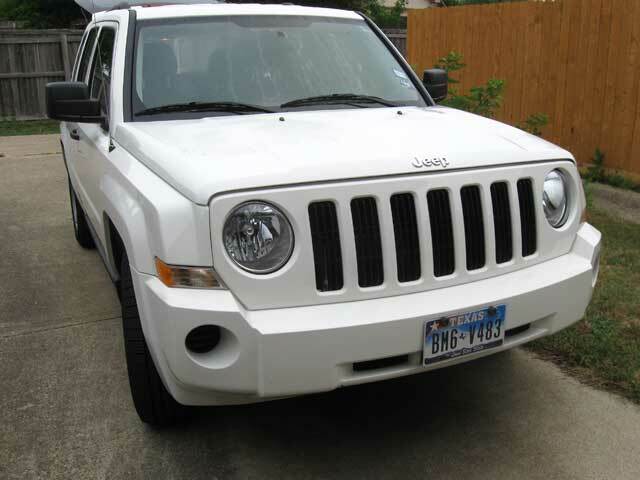 Insurance/Enterprise provided a car for us…it’s a Jeep…thing. Not a Jeep, Jeep…but a Jeep SUV…for little tiny short people…or maybe it’s a tall, fat, short station wagon. Anyway, nothing overtly wrong with it…but it is surprising that Da Altima has more room for passengers AND cargo (AND gets better mileage). Also…it doesn’t have a cruise control…which is annoying for long trips. 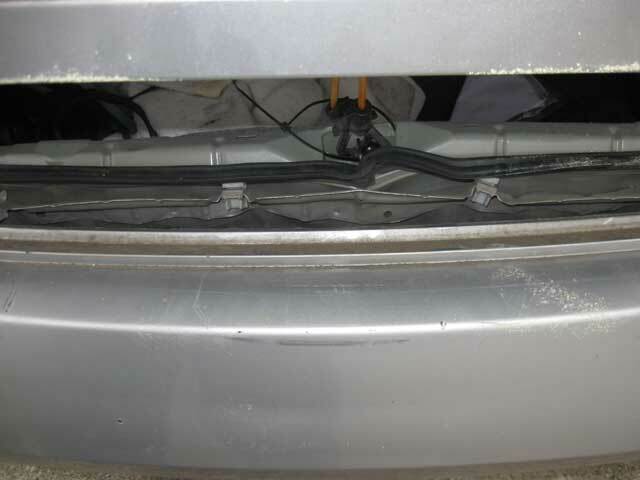 The trunk lid/deck needs replaced as it is bent, and is aluminum and can’t be fixed. The rear taillight pan is also going to be replaced. The insurance adjuster has already approved the additional parts/work. It doubled the price. I don’t think it should cost that much…but it’s their game and I’m not allowed to play. If I had to guess we won’t get it back this week.